Dates of all our walks on the seabed to Seymour Tower are listed here. We offer both day and overnight stays at Seymour Tower. Seymour Tower has undergone refurbishment by Jersey Heritage Trust as a short stay let. It sleeps 7 guests plus the guide in bunk beds, has cooking facilities, toilet and electric supply. The tower can only be used with advance reservation. 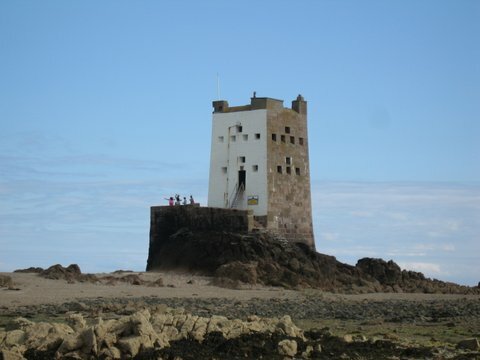 Seymour Tower is Jersey’s version of a mountain hut. Approximately 1 mile from shore, it is accessible on foot at most low tides (see below for kayak trips). Instead of mountain views enjoy the beauty and remoteness of this very special place, which is engulfed by the ocean twice a day. 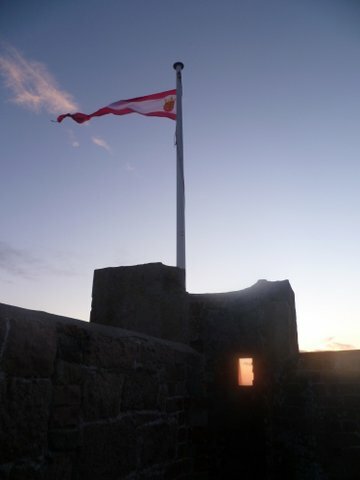 Accompanied by a local guide – who remains with you throughout your stay – you can discover and learn about this fantastic area, or just enjoy the opportunity to chill out at one of Jersey’s most unusual places to stay. 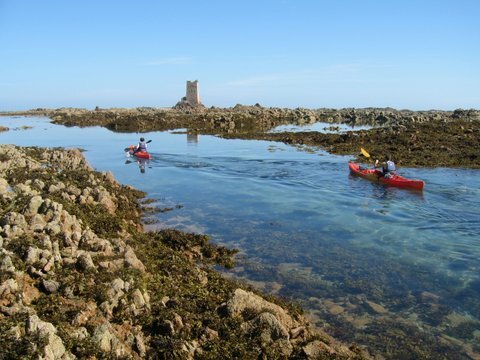 The tower lies within the internationally recognised Ramsar wetlands site of Jersey’s south-east coast. It was built in 1782 as a guard tower against French attacks. The roof offers a fantastic panorama. On a good day you can see Chausey (France), Les Minquiers, Les Écréhous and even the spires of Coutance Cathedral. Looking west you see Noirmont Point. Not to forget: the sunrise is something worth getting up for! During your stay watch in safety from the parapet of Seymour Tower the incoming tide, as it rushes in through the gullies and rises by up to 3 inches/8 cm per minute. Watch our video of this happening on our Video/photo page. Our organized day stays are ideal for people who may not wish – or don’t have the time – to spend 24 hours at Seymour Tower. 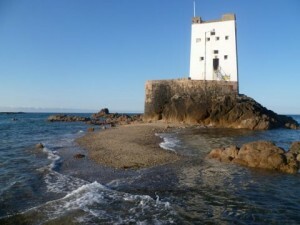 We have access into the tower, which has been converted into a “Jersey stone tent”, well appointed to rustle up a cooked breakfast after the early morning walk or, a tasty lunch after exploring the rocks and sandbars surrounding the tower. You may want to gather your lunch from the surrounding rocks and waters. However, to be on the safe side, it is best to pack basic supplies in case your marine forage is not so successful! You can safely sunbathe on the parapet, whilst the waves lap over the steps and the tide engulfs the tower. Enjoy the peacefulness of the area, the remoteness, and the elements in a special way. Individual bookings: Day stays of 12 hours £55 per adult, £45 under 18 years. 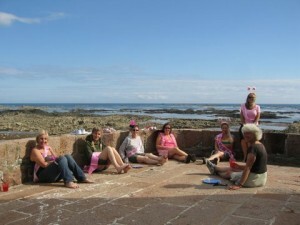 Private day/group bookings of Seymour Tower. Contact us for dates. Group/private bookings of the tower can be arranged for sole use: £350 (Maximum of 8 guests). Note: To ensure your safety and enjoyment you must be accompanied by an accredited Seymour Tower guide. Further information is supplied when you book. Facilities inside Seymour Tower click here. An overnight stay at Seymour Tower will give you the full experience of staying in this remarkable location. Many visitors have compared the stay to sailing on a stone ship –with the advantage that it doesn’t pitch and roll. View a 360° panorama: from Les Minquiers to Noirmont Point, along the coast to St Catherine’s Breakwater and the Normandy coast – and gannets diving in the east. The tower sleeps 7 people in bunk beds, has cooking facilities, toilet and electric supply. You must be accompanied by an accredited guide (occupying bed no 8). Walk across with your food and sleeping bags at low tide and return the next day. Price: For up to 7 people per night (accompanied by a guide) £350. Dates: Advance reservation is essential because access to the tower is subject to tides. Call to discuss possible dates. Sleeping bags can be hired for £5 per person. Not everyone knows 6 friends, who want (or are able) to stay overnight at Seymour Tower. This option makes the stay more like when you arrive at a mountain refuge or Youth hostel. Be prepared to meet other people and share tasks. Call us as we may be able to make up a group on other dates. Dates: Contact us for 2019 dates. Dates: Call 07797853033 or Email for dates. Drift through the gutters and gullies as the rising tide sweeps us along towards Seymour Tower. Imagine moving along a river, where the bank is a mass of rocks covered with an abundance of marine life. Drop a line overboard and try to catch your evening meal. However, in case you don’t get any bites we recommend you pack some food supplies for your stay! Learn about our coastal environment and the rich maritime heritage. After dropping your belongings at the tower we will explore the area by sea kayak. Paddle back the next day with a new perspective of Jersey. All kayaking equipment is provided including wetsuits. We have both user-friendly sit-on-top sea kayaks and modern sit inside sea kayaks which are designed to get you paddling easily. No previous experience is needed. You always paddle with a qualified kayak instructor from Jersey Kayak Adventures. Call and we will see if we can help make up a group. £100 per person subject to a minimum of 5 people with kayaks and paddle gear included. Dates: Call 07797853033 or Email. Hire of the tower for an overnight stay: For up to 7 people per night (incl. guide) £350, plus £41.50 per person for kayaking to/from the tower. All kayak kit is supplied along with waterproof bags. Sleeping bags can be hired for £5 per person. For more details about our island wide kayaking tours click here. More information about the facilities inside Seymour Tower click here. For safety reasons, it is a requirement that everyone staying at Seymour tower completes a booking form and signs an acceptance of risk. This must be completed and received by our office before the day of the trip. Failure to do so will result in your booking being cancelled. Alcohol is to be consumed in moderation. The guide may request alcohol is left on shore, if he believes the amount about to be taken is excessive. Clients are expected to pack in and pack out all their rubbish.